US President Donald Trump has forcefully claimed ownership of the US economy's vigorous health while denigrating the legacy of Barack Obama, the president in office during most of the last decade's expansion, but economists suggest any credit should be shared. "The Economy is sooo good, perhaps the best in our country's history," Mr Trump tweeted Monday, adding moments later that he had taken GDP growth over 4.2% "and we will do much better than this!" Mr Trump also tweeted, falsely, that GDP growth had surpassed the unemployment rate "for the first time in over 100 years." Mr Obama on Friday had called for an end to the boasting from the White House. "I have to kind of remind them, actually," he said in an address in Illinois, "those job numbers are the same as they were in 2015 and 2016." "The notion that what we're seeing right now is just a continuation of trends is not super defensible," he said. It has been rare for an economic expansion to stretch between presidencies of opposite parties, which usually try to shift blame for a slowdown. Recessions bookended the start and end of George W Bush's presidency and marked the end of George HW Bush's. They also occurred at the end of Jimmy Carter's and the start of Ronald Reagan's, leaving Mr Trump and Mr Obama in an unusual tug-of-war for credit. But economists tell AFP the truth is closer to splitting the baby: neither president is solely responsible and yet both deserve some of the credit for an economic recovery that without a doubt began under Mr Obama. "Given the two presidents involved, pyrotechnics and bombast were going to happen whether there was a recovery or not," said Douglas Holtz-Eakin, a former director of the Congressional Budget Office and adviser to former Republican presidential candidate John McCain. "There's no question that there's a mixture of credit involved. President Obama took office during the worst downturn since the Great Depression," he said. Meanwhile, Mr Trump has slashed regulations to energise businesses. Certainly, the economy is in usually good health: job creation has averaged 211,000 net new positions a month this year, the highest since 2015, when Mr Obama was in charge. The unemployment rate is at near-20-year lows, but recorded its steepest declines while Mr Obama was in charge. The economy grew at a 4.2% rate in the second quarter, the fastest since the third quarter of 2014 - again, under Mr Obama. The International Monetary Fund currently predicts 2.9% growth this year and next, marking the longest period of expansion in US history. 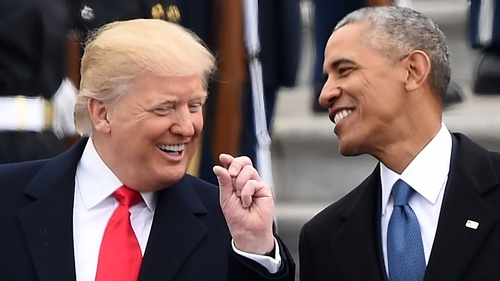 Last month, a Quinnipiac University poll showed the public may be starting to give Mr Trump an increasing degree of credit for the rosy state of affairs: 52% credited Trump, while only 37% credited Mr Obama. Yet, in another unusual twist, Mr Trump's popularity has been consistently and historically low despite the relatively good economic times. Jared Bernstein, who served as chief economist to vice president Joe Biden in the Obama Administration, said Mr Trump's deficit-financed stimulus and tax cuts likely boosted growth in the short term. "The data are clear that the expansion began under President Obama and if you just draw a straight line through much of it, you'll find that Trump is just riding on the trends that he inherited," said Mr Bernstein. He also noted that the fruits of the economic recovery have not been shared evenly. But hourly pay for mid-wages workers in that time has risen only a paltry 0.5%, he said. "So much of the growth is going into corporate profits and not enough into pay cheques," said Mr Bernstein. "When people ask me, 'how's the economy doing?' I ask them, whose economy are you talking about?"